Are you aware of God's economy which is in opposition to the upside down crazy world we live in? 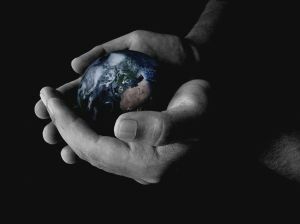 Christ taught us to be in the world but not to be of the world. What the heck does that mean? I mean if you live in this upside down, crazy world aren't you also of the world? This can be a difficult concept to understand but we'll try to shed some light on it. The world as we know it is highly influenced by the media, entertainment industry and those who are rich and influential. We are constantly bombarded with the influence of new music, styles and fads. These things are all praised by the world, and sometimes worshiped. Many of us go to great lengths to look like what we think is the 'it' thing happening in society. But God's economy doesn't want us to be of the world in this way. Why do you think that is? There are many references in the Old Testament where God's chosen people were tempted to worship gold statues and idols. These idols were beautiful and very much the "in" thing. God gave Moses the commandment "thou shall have no other God's before me"(Exodus 23:32). Can you see the connection here? Even though thousands of years have passed, we have continued to put other things in front of God. The images have changed from golden idols to electronic equipment, cars, clothing etc, but they are still idols we worship. I know you're probably saying "idols, I don't worship any idols. I go to church and worship God there". But this is a different form of idol worship. When wanting a better job, car, house, clothing etc drives the desires of our heart, then those things become our idols and we are not honoring God's economy. So now you are probably thinking that God doesn't want us to have the best of everything right?!! No! That couldn't be further from the truth. You see, God is like an extremely wealthy householder. In God's economy, his desire is to pour out his riches on all of his people(Ephesians 3:8), but he can only do this if we follow his plan. The entire New Testament reveals God's desire to pour out blessings onto his chosen people and to be their life supply.But how do we do that? How do we 'get' God's blessings and join in God's economy? Do we work really hard to change ourselves or maybe it's by going to church every week without ever missing? No, becoming part of God's economy doesn't require works. After we ask Jesus into our hearts by saying the sinners prayer we don't have to do anything. (Please see the link at the bottom of the page for a sample prayer if you have never asked Jesus into your life. )Although it's recommended that you study a bible to know what God expects of you. That's the awesome thing about God. Through the sacrifice of Jesus' death on the cross for our sins, we can just receive. But how do you receive and whom do you receive from? Well, Christ paid the price for our sins on the cross and acted as the gatekeeper allowing us into all the glory and riches of God. When we pray, we ask Jesus who intercedes for us before God to hear our prayers. As we receive the Holy Spirit(John 20:22), we are transformed into Christ's image. That seems like a lot to swallow but really it is simple. If we have a right heart and we are seeking God with all our heart, not material things and praying for God to guide us, we are often blessed with the secret desires of our heart(aka material things). You see, when we seek God with all our hearts, it's like God pours out a double blessing on us. When we are constantly glorifying God and including him in our everyday life, the Holy Spirit dwells within us and as in John 7:38 'those who believe in him, out of his innermost being shall flow rivers of living water'. Everything that was tired and boring before becomes new and exciting again. (I don't know about you, but that sounds to me like a fix for desiring the things of the world, don't you?) Some refer to this as baptism of the holy spirit. So, seek God and have a burning desire to please him, pray for His will in your life and be transformed! (Romans 12:2) After you have truly given your heart to God, miraculously the secret desires of your heart (worldly things) will become available to you and without any effort on your part. By learning to dwell in God's economy we can have everything God has promised us. Have faith and believe that God wants to bless you beyond belief and wait on God's timing. I think you may be pleasantly surprised to see that what God has to offer is much better than what the world has. And remember this- you can always count on God to deliver on his promises. See if you can find a guarantee like that from the world!